Hi, Bronchos! 🐴 I hope your week is going well despite the chilly temperatures! 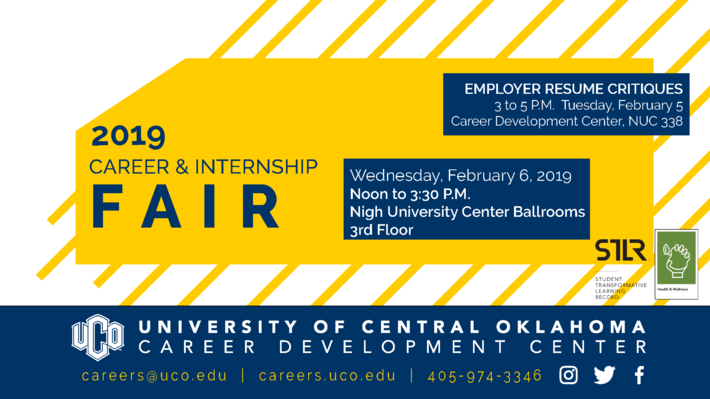 As you might have heard, the Spring Career & Internship Fair is just around the corner. The fair will be held on February 6th, 2019 from 12:00pm — 3:30pm in the Nigh University Center Ballrooms. 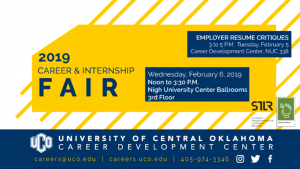 Although the fair is geared specifically toward upperclassmen who are looking for internships or jobs prior to graduation, the fair is open to everyone. I highly recommend you start attending the career fair now, even if you do not need a job. It’s a great opportunity to practice dressing professionally, speaking to prospective employers in a relaxing environment, and even discovering industries that you were unaware were compatible with your major(s)! If you are interested in attending the career fair, please remember that professional dress is required, and you also need to take your student ID. An integral part of the job application process is your resume. There is almost no job that does not ask to see a resume. If you already have a resume created, it is important to keep it up to date and fact check all of your information. Making sure that all of the information on your resume is true is exceedingly important. Many employers will pick specific skills listed on your resume and ask you to take skills tests or walk them through a specific scenario involving those skills. If it becomes clear that the details on your resume are falsified or embellished it can sabotage your job prospects and establish you as a person of low integrity. It’s always better to simply tell the truth, even if you’re under qualified, rather than risk sacrificing your integrity and possibly future job opportunities. There are multiple factors that play into finding a job, and these are just a few. Hopefully some of these ideas will help you get a head start on your job search so you have established professional relationships before you graduate. Keep up the great work and ROLL CHOS! Welcome to the Forensic Science LLC Blog! Subscribe today to receive the latest posts via email!